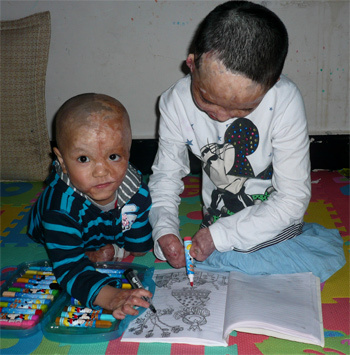 Little Min was burned severely over most of her body when she rushed into a burning house to save her baby brother in their native Yunnan Province, China. She did save her brother, but lost her fingers and most of her legs, which began conglutinating together so severely that she could barely use the bathroom. 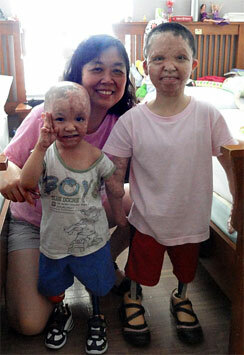 Little Min faced starvation if unable to get the needed care to reconstruct her perineal area. Walking again seemed ridiculously impossible. HandReach opened doors for Min and her brother at Galveston Shriners, where the children were treated by some of the top burn specialists in the world, receiving comprehensive surgery, nursing, orthopedics, rehabilitation, and psychosocial care. Now both children are walking and facing a much brighter future as they begin the journey of full mobility on custom prosthetics.